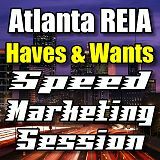 This was the Haves and Wants Speed Marketing Session that we recorded live at our June 6, 2011 Atlanta REIA Meeting. This is a new 30 minute session at our Atlanta REIA Main Monthly Meeting that starts at 6:00 PM on the 1st Monday of the month and is hosted by Joe Thompson. The purpose of this marketing session is to help facilitate deals by giving our members the opportunity to quickly market things they HAVE and no longer want and to find things they WANT but don’t yet have. Thanks to all those of you who participated. And special thanks to Joe for hosting the session and to Alan McDonald for recording the session and improving the quality of this video each and every month. Download June 6, 2011 Speed Marketing Flyers (pdf).